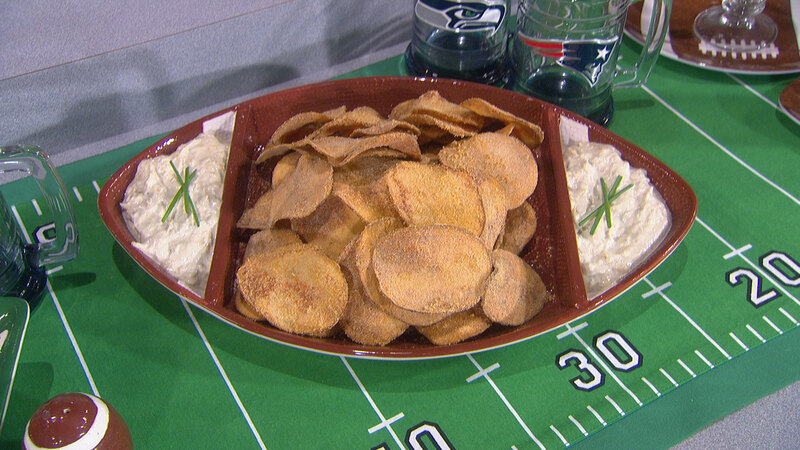 Chef Jason Santos shares gameday-friendly recipes to prepare you for Sunday's big game! Pre heat oven to 300F* place the wings in deep pan, cover with canola oil and place parchment over top. Place in the oven until the meat begins to pull away from bone, about 2 hours. Pull the wings from the oil and let cool. 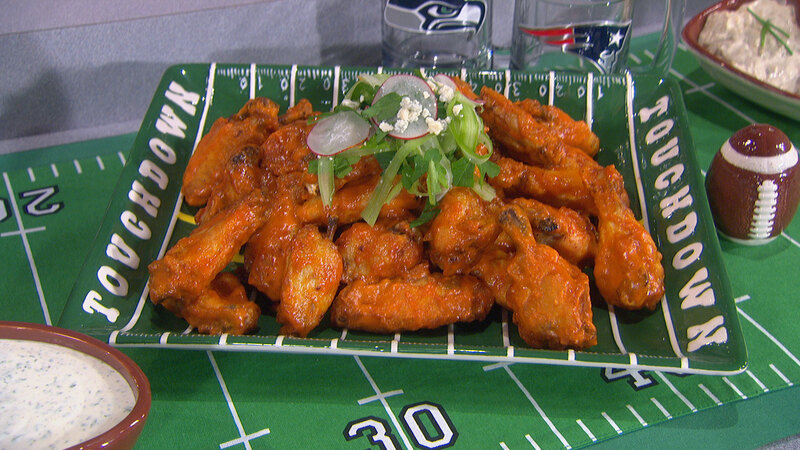 Preheat a deep-fryer to 400 degrees F. Fry the wings until golden brown and crispy, 3 to 4 minutes. 1. Sweat garlic & onion in ½ of the butter, add spices and cook for 30 seconds then deglaze with white wine, add hot sauce & brown sugar. Puree with remaining ½ lb butter and season with honey & salt & pepper. 1. Mix all ingredients and season. 1. Toss hot wings in buffalo sauce and stack, top with blue cheese salad and garnish with micro greens. Serve with a side of creamy herb ranch. 1. Preheat the canola oil in a kettle or heavy gauge pot. A deep-fry thermometer clipped to the pot should reach 325 degrees F.
2. While the oil heats, line a large bowl with paper towels. Mix & store in an air tight container. 1. In a sauté pan over medium heat add evoo, add onions and spices. Cook until the onions are caramelized, about 20 minutes. Remove from heat and set aside to cool. Mix the rest of the ingredients, and then add the cooled onions. Season and refrigerate and stir again before serving. 1. Heat the vanilla bean, cinnamon stick, milk & half-and-half in a saucepan on to a simmer. Remove the pan from the heat and add both chocolates. When the chocolates are melted, add the sugar and espresso powder and mix. Reheat gently, remove vanilla bean & cinnamon stick and add tequila to taste. 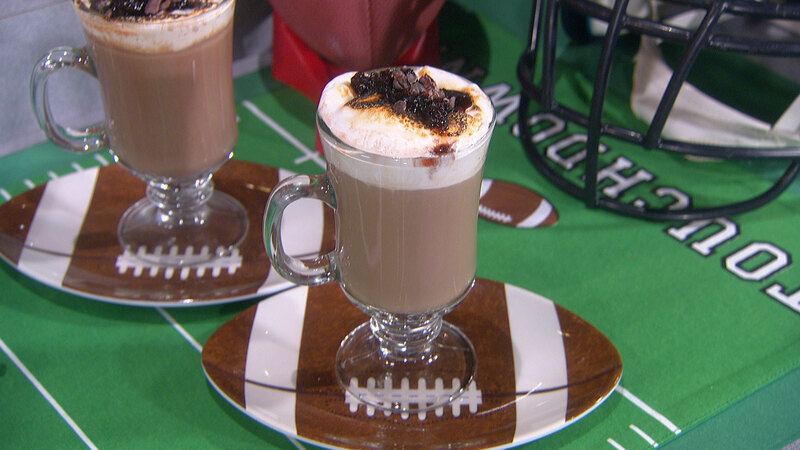 Pour into mug and top with marshmallow fluff, torch until slightly burnt then top with cocoa nibs & cherry jam. 1. Simmer until sticky & syrupy.